There’s no better place to enjoy the good life of fine coastal Carolina living than in this great community of luxury homes. 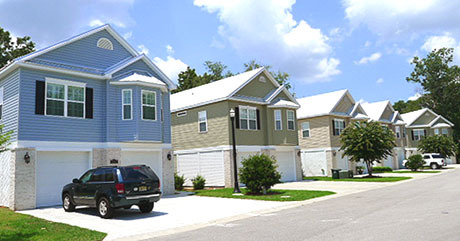 Most recently a new section has been added with Charleston-type homes called "The Cottages at the Surf". These homes will appeal to those who don't care for large yards to maintain, yet want a larger home with multiple stories. The cottages have several models and colors, and have a one or two car garage. See our page for these! With the great Surf Estate homes and cottages, as well as a number of vacant lots available, Barefoot Realty is ready to be your guide to the good life at this or any other community of North Myrtle Beach homes for sale. Gorgeous LAKEFRONT lot in North Myrtle Beach's Surf Estates. Build your dream home here! You'll be close to the beach, shopping and dining! Awesome golf course lot within walking / golf cart distance to the ocean and all of NMB. Great trees all around and pond view across the street.